A man who drove a car into London pedestrians outside Britain's parliament this morning was a British citizen who originally came from another country, British security minister Ben Wallace has said. 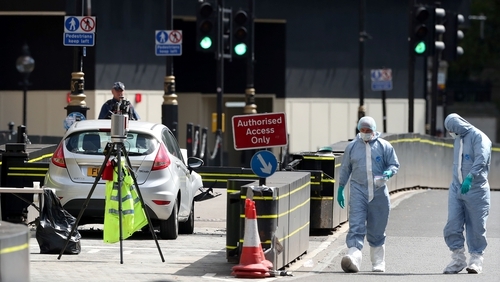 Police arrested the man early today after he hit pedestrians and cyclists before ramming his car into barriers in Westminster. "He's a British citizen," Mr Wallace told the BBC. "He came from another country originally. It's only being treated at the moment as a terrorist incident and we haven't yet fully confirmed that." Police said the man detained is 29 years old, and they are carrying out searches at three addresses in the midlands in relation to the incident. Scotland Yard has said the man was not known to police or MI5. He is being held in custody at a south London police station but is not co-operating with officers, counter-terrorism head Neil Basu said. He was arrested on suspicion of terror offences after the silver Ford Fiesta he was driving collided with cyclists and pedestrians before crashing into security barriers just before 7.40am. "Given that this appears to be a deliberate act, the method and this being an iconic site, we are treating it as a terrorist incident and the investigation is being led by officers from the counter-terrorism command," said Mr Basu. "We have not formally identified him yet. On the details we have at the moment we don't believe this individual was known to MI5 or counter-terror police." The silver car was seen driving along the road next to Parliament Square before moving to turn right towards Westminster Abbey. Two white vehicles appear to be behind the car shortly before the crash but Mr Basu insisted: "There was not a police car in pursuit of the vehicle." Images posted to social media showed a man wearing a black puffer jacket being led away in handcuffs from the car. Mr Basu added no other suspects have been identified and there is "no intelligence at this time of further danger" to Londoners. One was discharged from St Thomas' Hospital before midday, while a woman is being treated for serious but not life-threatening injuries at St Mary's Hospital. British Prime Minister Theresa May said the attack is shocking and warned that the terrorism threat to the United Kingdom remained severe. "The threat to the United Kingdom from terrorism remains severe. I would urge the public to remain vigilant," Mrs May, who is out of the country on holiday, said in a statement. Mrs May's spokesman said she has had regular briefings with security officials throughout the day. "I was getting off the bike and put my foot down, then there was a sound like tyres screeching," he told the Press Association. "This car turned round to the left and swerved into the wrong lane of traffic and into the bank where all the cyclists wait." Cyclist James Maker of Chelmsford, Essex, passed the scene in Westminster minutes later and saw a woman injured on the ground and the car crashed into the barrier. "I looked to the right-hand side and there was a cyclist on the floor, clearly injured," he said. "It was a woman, they were clearly quite injured, they weren't moving and they were in the recovery position." Masood abandoned his car then stabbed and killed unarmed policeman Keith Palmer before he was shot by armed police in a courtyard outside parliament. In addition to five attacks that occurred last year, authorities say they have stopped 13 Islamist and four extreme right-wing plots since the Westminster attack in March 2017.